What sort of pipe smoker are you today? Do you like to play the field, constantly trying new blends, endlessly seeking the next great pipe? Or are you happily a creature of routine, finding satisfaction with a single tobacco and the same few pipes you’ve had for years? Both are creatures of habit. Either will likely insist that they are fully satisfied with their pipe smoking, that it’s "the way to do it." One has found reliable, pleasing combinations, the other derives pleasure from endless variety. And, at the risk of wetting my wellies in a murky puddle of relativism, neither of them is wrong, but each might benefit from spending a little time in the other’s house. Here’s the self-indulgent part. As a symptom of my own peculiar split-personality, I usually find myself oscillating between these two extremes. When I’m working on something new, it’s all I want to smoke, all I will smoke, and even when the new baby has gestated and been delivered into the waiting pipes of eager smokers, it’s hard for me to break the habit. Somewhere in the shadows of the insanity that’s part of my job description, I become convinced that this is the best thing I’ve ever done, that I could enjoy it, and nothing else, from now until the end of days, and then, gazing at the cabinet on the wall, the pile of briars on my desk, the drawers full of pipes and boxes full of tobaccos untouched through the passing weeks or months, I vow to thin the herd, trim the fat, dispossess myself of all the extraneous briar baggage and superfluous tins. Fortunately, my natural tendency towards procrastination prevents this happening too quickly, because the tables will turn, as they always do. One day, I’ll get an email from someone curious, asking about a blend of mine that I’d been ignoring, or some old classic that I hadn’t thought about in months or years, and do I have anything similar? It will rattle my brain, shake the dust off, and inspire me to revisit something I haven’t tasted in a while, and that first puff is revelatory. Viewing it with fresh eyes, so to speak, it becomes the antidote to a palate jaded by constancy. Like what you see here? Why not sign-up for a free membership? We are constantly producing new articles, how-to advice, educational articles about pipes and tobaccos, and entertaining pieces as well. By signing up, you will receive our bi-monthly email with links to all the new content. You can also participate in our forums and comment on articles without having to fill out the form, (as long as you are logged in). This is the friendliest, most fun, informative and entertaining pipe smoker site in the world. Join Now for FREE! This triggers an inevitable transition to the other state, where I’ll bounce from pipe to pipe, from blend to blend, constantly seeking the excitement of newly revitalized experiences, wondering how I could have fallen into the rutted course of sameness. I open tin after tin of new and vintage blends, relishing the spice of all their variety. Dusty pipes are polished and enjoyed as I wander the woods, seeking out those perfect combinations of briar and leaf, the ones that seem to outshine all the others. Then, without warning, a lighting strike of inspiration sets fire to a nearby tree, and I wind up obsessing over a new blend idea, the table turning back again, the cycle both completing, and beginning, like a strange dream with no escape clause. It’s a kind of madness, but on the positive side, it’s taught me a few things about both the extremes, and the more sane realm of the middle path, the one I too rarely walk. On one side, there’s the cultivation of a deep appreciation for a single blend, or a couple, a few cherished pipes, and the satisfaction that comes from comfortable familiarity. They become like old friends who know what you’re going to say before you do, the ones you want to hang out with when you need to laugh a little, cry a little, share life’s stories, discuss the latest book you’ve read, or just sit quietly in the company of another. On the other lies the excitement of a world filled with continuous change, like finding yourself in a new city every day, wandering its strange streets with a child’s wonder and enthusiasm, never knowing what new experience will be met face-on round the next corner, meeting new people, tasting new foods. Not every experience will be a good one. It’s unpredictable, but it’s fun. It’s a vast world, after all. It’s a strange phenomenon. In other areas of our lives, the playground is usually more balanced. Would we choose to eat the same foods day in and day out? Or, bounce from cuisine to cuisine, never enjoying the same dish twice in a year? Yet, as pipe smokers, many of us seem predisposed, at least occasionally, to the sort of compulsion that results in a strong gravitational pull towards one or the other extreme. We become creatures of habit. So, back to the original question: What sort of pipe smoker are you today? I suspect most reading this will lie sanely somewhere between the extremes, enjoying a few different blends, a rack or two full of cherished briars, occasionally venturing into the unknown to discover something new to add to the mix, or replace something that’s grown tiresome. 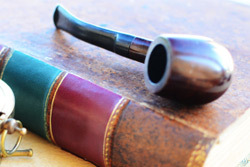 But, if you do happen find yourself having drifted towards one end or the other of the curve, you might open the window to some new and interesting pipe smoking experiences by taking a page out of the other side’s play book. If you smoke the same thing day in and day out in the same pipes, change it up. Try something completely different. Try a new pipe, maybe a clay or a cob, and a new blend in a style you haven’t smoked in a while, or one you recall not enjoying when you last smoked it. If you’re constantly exploring new things, take a step back. Pick a tobacco and really get to know it, exploring the subtlety and nuances brought out by the same blend smoked consistently in a few different pipes. Since 1999, Gregory L. Pease has been the principal alchemist behind the blends of G.L. Pease Artisanal Tobaccos. He’s been a passionate pipeman since his university days, having cut his pipe teeth at the now extinct Drucquer & Sons Tobacconist in Berkeley, California. Greg is also author of The Briar & Leaf Chronicles, a photographer, recovering computer scientist, sometimes chef, and creator of The Epicure’s Asylum. See our interview with G. L. Pease here. When asked “what is my favorite pipe?” I usually answer: the last one I bought. Tobacco can be like that as well, especially if I really enjoyed that last smoke. But, Just when I think I have found “the one,” another blend appears on the market, and I have to try it! I had 12 pipes for 20 years and smoked the same two blends, then I found this forum, and I can no longer be content until I have tried everything. Now I have 81 pipes and 60 blends on hand. My smoking habits may have become routine, but my tastes seem to change very time I turn around. Hopefully, I won’t ever fall into the single blend/single pipe rut ever again. Thanks, Greg! Your tobaccos helped me started on this world-wind trip. Great article Greg, a very interesting topic. I believe I fall somewhere near the middle. I have 34 pipes currently but am always on the look out for specific ones to add to my collection. I have culled the herd a number of times as my tastes changed over the years and have now finally figured out exactly what I want in a pipe. My tobacco choices are somewhat limited in that I only enjoy Va, Vaper and Vabur flakes. I went through my experimentation of tons of English and other Virginia and Virginia/Perique blends. I finally figured out I cannot smoke blends with Red Virginia’s after years of painful attempts. I now have 28 blends in my cellar and a rotation of 26 available to me at all times. I do still look for new blends( only flakes) and have recently found 2 new great tasting ones. Once I find a new flake to cellar, I go balls to the walls buying it so I can start the aging process as soon as possible as I do love smoking aged tobacco. I will always look for a new flake to try, but the chase is not as important as it used to be. I always look for another addition to my pipe collection, but since I am so particular now as to what I want, the opportunities are few and far between unless I am commissioning a pipe. 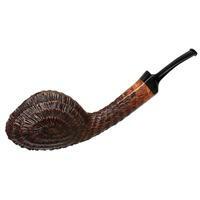 I find that I am at a very comfortable place with my pipes and tobacco. I have a ton of great combos where a certain pipe makes a particular blend sing and when I get these combos, I look no further and that pipe is fully committed to that blend. I honestly don’t think I will ever stop looking for new things to try as I do love variety, but my focus is now much narrower so the choices are definitely much less. Like many, I’m probably in the middle. But truth be told I tend to stick with only three or four blends, but smoke them in a sixty pipe roration. So, after many many years, I’ve settled on few blends, many pipes. 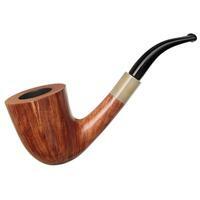 This works for me, as I pipe all day, so I go through five or eight pipes a day. I’ve tried to expand my blend repertoire, but keep stocking up on only my handful of old favorites. Which are Star of the East, Pirate Kake, Westminster, and Abingdon. Oh, and Prince Albert or Lane’s 1Q to break the Latakia stream. St. Bruno when I can get it. Great article - amusing and thought provoking as ever. Having said which I am a bit surprised to find my self middle of the road, sensible and, not to put to fine a point on it, rather dull. I have my absolute favourite tobacco smoked in eight or nine pipes, followed by three or four other lesser favourites each allocated a smaller number of pipes finally complemented by one or more new tobaccos in tasting pipes - for the last few months this has revolved around current perique blends. Analysed this way it sounds a bit, well actually quite a lot, chillingly orderly. In mitigation I would compare the pipe tobacco experience more to wine than food where there is a similar tension between the drinker in me, a few glasses of an established favourite with dinner, and the taster in me, whatever is, say, Chilean Pinot Noir like (not up with stellar Burgundy or Oregon but very presentable and excellent value in my view). 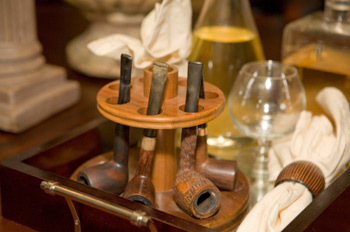 In both tobacco and wine the tasting and finding out something of how the blends, both are more or less always blends, are constructed somehow adds fun and interest to routine consumption. With food tasting new dishes or new variations of classics is the same but has to compete more with the necessity of refuelling, for example, almost always the same food for breakfast. Great photograph of some heavily used pipes by the way Greg - your usual photographs of mint condition pipes are a joy to behold but always have me looking guiltily at my racks of battered friends. Looking forward to your next creation in its due time - perhaps it will take me in a new direction as not a few of your past masterpieces have and were instrumental in converting me from a one blend consumer to a multi blend taster/smoker. 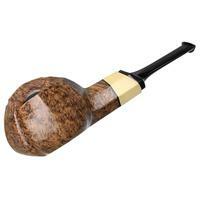 There are certain tobaccos I almost always have on hand– such as Dunhill Nightcap, and Mr. Pease’s own creation, Odyssey, and there are a few pipes that I seem to choose ahead of some others. But I do like to experiment and try new mixtures too, especially of the general types of blends I enjoy most– medium to full English mixtures, stoved Virginias and VaPers especially. So, I guess I fall somewhere in between the two extremes Mr. Pease wrote about. 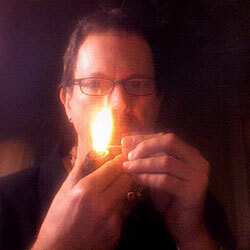 I am perhaps an unusual piper as I often only smoke one bowl per day and happen to be an ex-smokeshop employee. I also smoke cigars, but lean more towards pipes as the years go by. I smoke from a rotation of about 13 pipes regularly which I’ve acquired gradually and I still have never bought a pipe which retailed for over $100- regarding that as profligacy. While I do feel the lure of acquiring more and wanting fresh eye candy like anyone, I’m too frugal and practical to indulge in an unrestrained way. Another thing which chases me away from mindless indulging is that the sheer geekiness of it all shames me. I’ve found many great basket pipes to be more than reliable, but Peterson is a brand I admire greatly and own 3. I began my own blending early on, but that was when I had a full range of PS tobaccos and others to sample free, but back then I was more interested in cigars. I wanted one blend I could rely on so I made one. I’ve tweaked it as needed over the years and now have something very complex and interesting, but I’ve also always relied on a variety of available Latakia blends. Now I’m recently into Vapers and buying tins finally, as I’ve grown to crave variety, even though I’ve always been a big believer in “knowing what you like”. Did I mention that I’m also fairly sure that I’m a super-taster? I also try to keep my habit at a low- degree of consumption so I don’t burn out my taste buds or lose my palate. So while I am conservative and refuse to spend unrestrainedly, my interest continues to grow and develop. I couldn’t be happier about any of this. The behavioral aspects of blend selection that you have identified might serve as a template for cellaring strategies. Stocking up for the future forces some reflection in light of your observations. Thanks, this article may turn out to be an important contribution! Cortez, my strategy for cellar-building has always been simple, and has served me well. When I finish a tin of something, I replace it with two, one to enjoy now, and another for the cellar. That way, I’m always stocking up on the things I’m enjoying most, and not getting weighed down with the things that are only ‘occasional’ smokes. Of course, it also means that I sometimes haven’t laid in enough of something I later find to be a fave, but so it goes. Life is a process of managing disappointments. It’s nice to know that my little contribution here has stimulated some interesting thoughts. About 18 months ago I decided to quit. At that time I had about 30 blends from which I regularly smoked and 70 more in jelly jars of blends I’d opened, smoked and then forgot about. When I resumed smoking I vowed to never have more than a dozen open at any one time but am up to 30 once again. I have to be careful as the thought that I should open something doesn’t seem to connect any too readily with the standard of not reaching 100 once again. When I quit I had 70 pipes; now I have about a dozen briars and two dozen cobs. I like to dedicate. 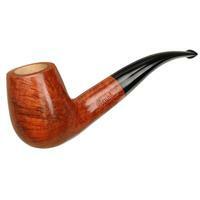 I try not to buy every briar I like and am leaning toward mostly smoking cobs. I’ve also become very price aware and am biting only on great buys. That makes me laugh,4nogginsmike, because I’ve been fighting the tendency to open tins myself since I bought them last summer. I’m pleased to have only 2 tins open right now, but my self-discipline suffers in many other aspects. You are however likely a more serious smoker than myself. And where I live it’s a very dry climate, so I’m able to say to myself in summer that I’ll hate it if I have open tins which will get dry as my bulk tobaccos do. Now with the advent of cooler, moister weather I’ll be breaking into my latakia tins soon enough. I’m too undisciplined to dedicate pipes, and I really don’t mind the consequences either, maybe because full aromatics aren’t really my thing. 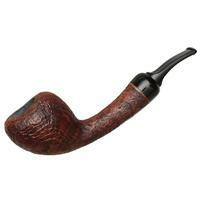 My discipline also took a slide though when I saw this humble offering- http://www.ebay.com/itm/1950s-COMOYs-made-DRURY-LANE-Estate-Pipe-VERY-NICE-s58/251353988824?_trksid=p2047675.m1850&_trkparms=aid%3D222002%26algo%3DSIC.FIT%26ao%3D1%26asc%3D11%26meid%3D1845470906855572717%26pid%3D100011%26prg%3D1005%26rk%3D5%26rkt%3D5%26sd%3D370910195350%26 and I could not resist a cheap pipe older than myself. What’s weird is that the mouthpiece is a saddle-bit with two (2) exit holes for the smoke- like a couple of tiny nostrils. The smoke passage forks into twin tiny openings, which will likely mean more soaking than reaming when it comes to cleaning. Anybody ever hear of such a set-up? I think Mr. Pease said it well in his articles, that the extremes of having too many or too few selections might be better avoided. This article was really interesting for me as far as the number of pipes and number of blends smoked. I do have a question on cellaring certain blends - Do Perique blends tend to gather strength over time? I cellared the Mississippi Mud blend from Conell & Diehl and after a little over a year, it seems to have gained strength. I’ve also got some other Latakia blends with Perique aging now and I was just curious if these will also smoke a little stronger. I do like the strength after aging. I always wonder what people mean when they use a word like “stronger”. Are they referring to flavor or nicotine content? Both flavor and nicotine content in my case. I was just curious if anyone else got similar results from aging. I always assumed that the high I get from these blends was from nicotine and if that difference from “fresh” blends and aged blends was the nicotine and if the aging increases the nicotine hit or not. A added note on the previous comments; the effect that I was referring to as far as strength and flavor seems to be more noticeable in blends with Perique or Perique/Latakia. The only thing that makes sense to me JRIN, is that it has to be the perique, unless it’s your imagination. Compared to the average, my guess is that I’m not at all a big consumer of tobacco. For basic smoking in warm weather months, I rely on my own blend, which I put together as I need it from components I buy in bulk. Because I don’t keep lots of my blend pre-mixed sitting around, I’m not using any methods to actually “age” it, either- except for the passage of time in a dry climate. Tobaccos are however said to “marry” with age. I still can’t determine for myself how different my bulk tobaccos would age if they were all blended together at once. That said, it seems to me that my blend also does seem to get a bit more concrete if I leave it sit around while smoking manufactured vapers, aromatics, or latakia blends. I like to have the ability to “tweak” my blends at will, with the addition of other tobaccos if I feel the need, and as I run out of other bulk components and replace them. For me that’s a basic 45% VA., 45% black Cavendish, and 10% perique. Actually, that what it used to be, before I began mixing it 50-50 with Newminster Superior Slices. So my cat’s out of the bag and I don’t know what it is you happen to be smoking as perique blends. I have however been blending on my own with perique for about 15 years. I’m not a nicotine nut by any means, but I find the perique gives me what I need for nicotine in an admirable way. Something else: In the cigar world, if I’m not wrong, Vitamin N is often created in a cigar by the amount of “ligero” leaf used. As I keep cigars in my humidors, they get more mellow flavor-wise with age, and actually the nicotine seems to as well. Contradictory? Quite possibly. we are however talking apples and oranges to one degree or another. All I know is that as I age, I welcome higher nicotine in my pipe and lower nicotine in my cigars for reasons I’ll not disclose here for the sake of brevity in an already very long post. I really appreciate the straight-forward answer ststephen. What you said makes a lot of sense. I thought you’d find my brevity and clarity to be refreshing, jrincr01. OK, I’ll give it another shot; see I was hoping a real expert would chime in. If you’ve read enough of these articles in the last couple years (here and elsewhere)you might get the overall impression I have: Latakia does little good as it ages, but Virginia does, and I think perique and burley do too, but maybe to a lesser degree than Virginia. Keep in mind though that just about all Latakia blends have VA in them, so one of those blends could actually improve with age. I do not think nicotine levels increase with age though. I’ve definitely got a split personality. With tobaccos, I generally smoke only a couple of blends, and those I keep smoking for eons before I venture out to try something different. Mind you, I spent years promiscuously trying out various blends before settling into marriage. With pipes, I’m on the constant prowl for the next addition to a collection that is larger than any sane person can possibly use, even though it’s not all that large in comparison to some that I’ve seen. PAD, not TAD have I.
I’ve only been with pipes for 2 years now. Starting out with a small clutch of Stanwells which were smoked hard because of my small pipe rotation. It took me a couple of months to find a solid likeable bacca, Mac Baren Golden extra, I won’t mention the other horrible choices I made on the way to finding something decent, but they were total shots in the dark, grabbing at straws. When I found something I liked, I thought I’d settle in with it and go codger-style, mostly because the financial outlay for sampling the broad range of available blends can be quite costly. Thankfully, I discovered the online pipeworld which filled the void of my knowledge vacuum, there are no local tobacconists where I live, so the forums have become a crucial element in my evolution as a pipesmoker. The first Holy Revelation I had with tobacco was with GLP Jack Knife Plug and OMG I’ll never forget that first evening, it’s still a very distinct and rich memory that summons salivation upon reminiscence. I was in one of my periodic states of mania and stayed up all night, smoked 5 pipes of JKP back to back, I was in a total state of bliss, almost in an altered state of consciousness, it was deeply meditative and an intense joy. That’s when I discovered that tobacco can be much more than simply smoking in a mechanical sense, that indeed it can be utterly divine with an almost spiritual dimension, thank thee Dark Lord. After that I became a serious student and I’m still in the stage of exams, reading thru all that I can. At this point I’m much better equipped to find my blends as I’ve developed a good base for my preferences and go from there, but I’m still eccentric enough to wildly veer off-course in hopes of another revelation. Sometimes the experience of trying something new is a catastrophic letdown, but when something new trips my trigger the great big loud bang bang makes it all worth the effort. Very nice article to read while smoking pure fresh virginia:D.